Deal Book. Booz Allen Hamilton Incorporated is a corporate strategy and consulting firm in change management and technology and does 99% of its business with the U.S. government and its manifold departments. Last year’s sales were just short of $6 billion but with 24,500 employees that’s only about $250,000 per head, so to speak, and falls far short of many-a-Wall Street trust and legal adviser, let alone an “investment banker” like The Carlyle Group. 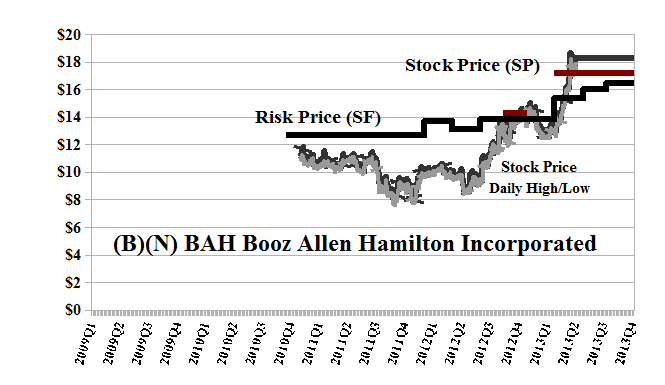 Booz Allen was founded in 1914 and is a bespoke firm for government contracts, but was acquired in 2008 and then taken public at $17 per share in 2010 by The Carlyle Group which has recouped its investment plus 100% and still owns 67% of the firm (Forbes, June 10, 2013, The Carlyle Group Has Made $2 Billion Off Of Booz Allen). The Carlyle Group was founded in 1987 with a capital of about $5 million, and is a bigger story for investors than Booz Allen, but skittish investors, anxious of the future, in the small float sold off about 1.3 million shares today, about three to four times the average daily volume, but knocked less than 50¢ off the share price (Forbes, June 9, 2013, NSA Contractor Booz Allen Hamilton Rushes To Distance Itself From Staffer Who Leaked Top Secret Docs). The stock pays a common dividend of $0.40 per share per quarter or $55 million per year for an encouraging yield of 2.2%. Our estimate of the current downside due to price volatility is minus ($2.25) per share so that any price between the current $18 and $16 to $20 should not surprise us. It’s trading above the Risk Price (SF) of $16 and rising, and could be included in the Perpetual Bond™ for that reason alone, and without further “deep thoughts” about who owns what and why (Red Line Stock Price (SP) above the Black Line Risk Price (SF), and for no other reason). After all, we’re just investors and, basically, bystanders & collateral damage, because The Carlyle Group is running a tight ship as Booz Allen’s debt increases and the shareholders equity vanishes as a “capital surplus”. Booz Allen Hamilton, a strategy and technology consulting firm, is a provider of management and technology consulting services to the U.S. government in the defense, intelligence and civil markets. From the Company: Booz Allen Hamilton Holding Corporation provides management and technology consulting services in the United States. Its services enable clients to address various challenges, such as combating global terrorism, improving cyber capabilities, transforming the healthcare system, improving efficiency and managing change within the government, and protecting the environment. The company offers services in the areas of strategy and change management; organization efficiency and effectiveness; human capital, learning, and communications; cloud, decision, and mission analytics; cyber technology; strategic technology and innovation; systems development; enterprise integration; engineering; and acquisition, program management, and logistics. It primarily serves the United States government and its agencies in the defense, intelligence, and civil markets. Booz Allen Hamilton Holding Corporation was founded in 1914, has 24,500 employees, and is headquartered in McLean, Virginia.